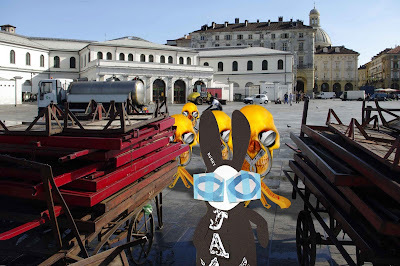 The Wabbit wandered through the Porta Palazzo market in a sceptical mood. He hadn't seen any Gnamskulls and he certainly didn't expect to. He mulled the matter over for a while and thought about what the Gnamskulls liked. "If they have a preference for dodgy food, then why would they come to Turin?" he wondered. He hopped between two traders' barrows to the street beyond. It had been a while since the market closed for the day and the Wabbit sniffed the air and twitched his ears. 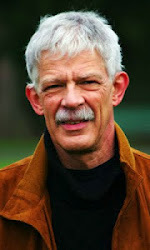 He could hear garbage trucks going about their business, clearing discarded rotten vegetables and other refuse that had suffered in the afternoon sun. "Phew! 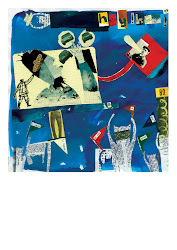 What a pongy pong poo smell," said the Wabbit and he wrinkled his nose. "All the same," he thought, "Porta Palazzo is very clean today." He looked at the traders' barrows and shook his head. "There's hardly a leaf left over." Despite the smell, the Wabbit rummaged in his fur for the remains of a salad sandwich from lunchtime - and hopped towards the Corso Giulio Cesare. "Nope, I don't think they'll come," he thought.